GENEVIEVE has weakened into a tropical storm. At 8 am, GENEVIEVE was centred about 1750 km (940 NM) N of Wake Island. GENEVIEVE is the 7th name in the 2014 northeastern Pacific tropical cyclone name list (24 in total). 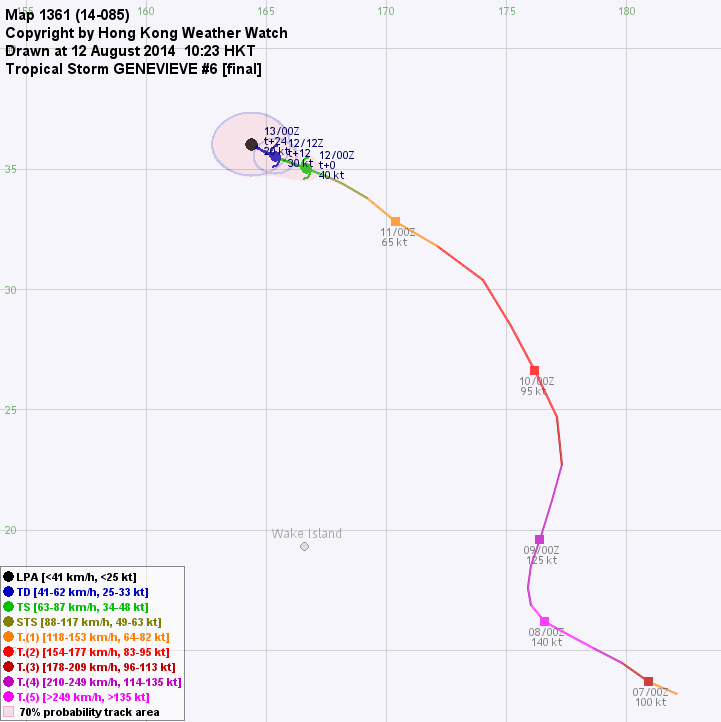 GENEVIEVE has slowed down considerably and is expected to move WNW slowly in the next 24 hours. GENEVIEVE has lost most of its deep convections. With low sea temperatures, GENEVIEVE will continue to weaken and dissipate over water. This is the final bulletin on GENEVIEVE. GENEVIEVE is moving NW and is weakening steadily. At 8 am, GENEVIEVE was centred about 1550 km (840 NM) NNE of Wake Island. GENEVIEVE is moving quickly along the southwestern periphery of the subtropical ridge and around an upper-level low. It is expected to decelerate sharply due to a propagating trough that will weaken the ridge. Due to the unfavourable environmental conditions, GENEVIEVE is expected to weaken into a tropical depression before recurving to the east. Sea temperatures are very low at GENEVIEVE's location (around 24 degrees) and divergence is limited. These will cause GENEVIEVE to weaken rapidly into a tropical depression two days later. 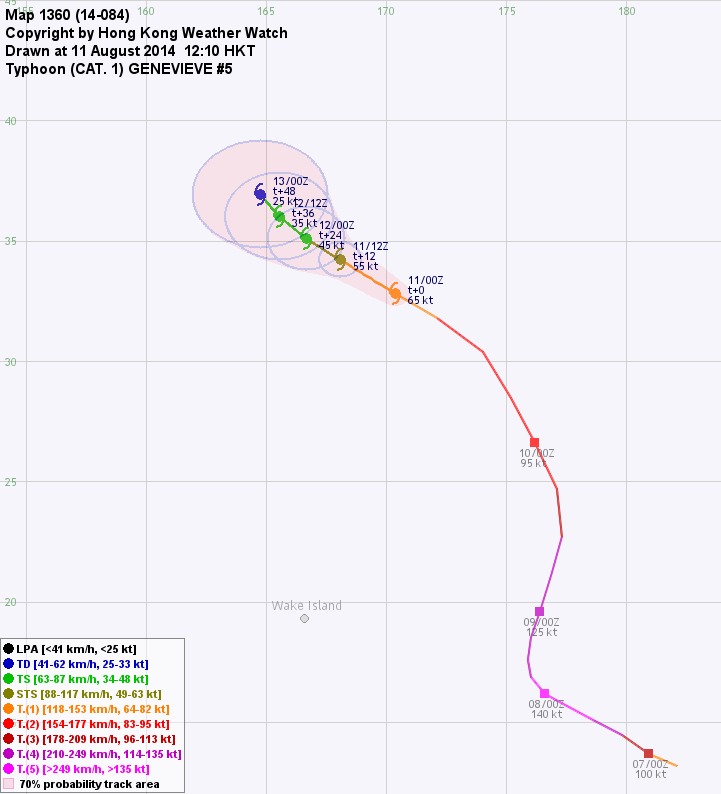 GENEVIEVE has further weakened into a category 2 typhoon. 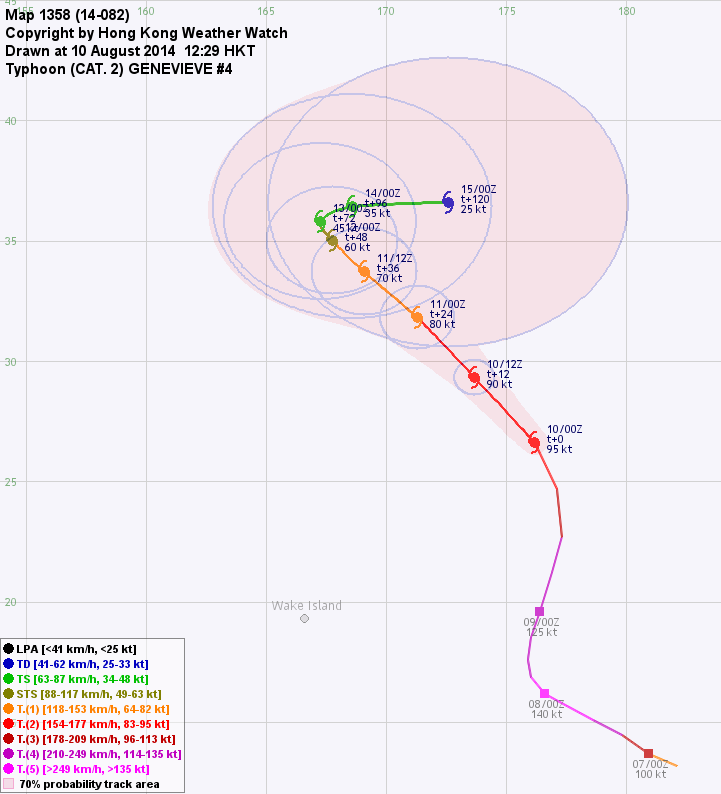 At 8 am, GENEVIEVE was centred about 1270 km (690 NM) NE of Wake Island. GENEVIEVE is moving quickly along the southwestern periphery of the subtropical ridge and around an upper-level low. It is expected to move NW in the next 36 hours. Subsequent forecast has changed and now a trough is expected to erode the ridge, reducing steering and rendering GENEVIEVE motionless near t+72. Thereafter the ridge should build again south of GENEVIEVE, forcing the storm to move east. GENEVIEVE weakened appreciably last night but it seems to have re-consolidated over the past 6 hours. Nevertheless, shear and sea temperatures are not favourable for storm development, and GENEVIEVE should weaken gradually over the next 5 days. 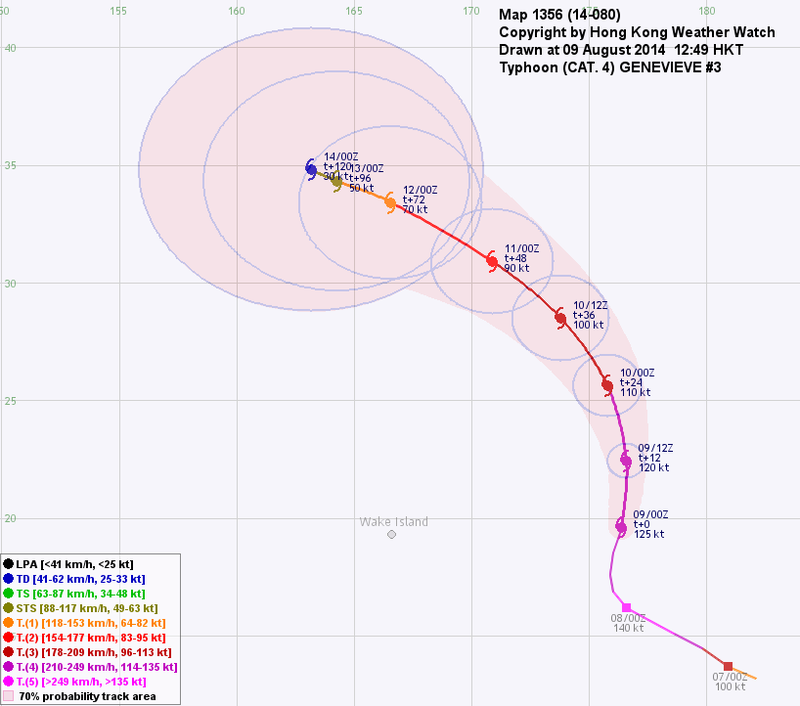 GENEVIEVE has turned north and weakened into a category 4 typhoon. At 8 am, GENEVIEVE was centred about 1020 km (550 NM) E of Wake Island. There is a weakness in the subtropical ridge north of GENEVIEVE, yet the ridge is still intact at higher latitudes. GENEVIEVE is thus expected to move N turning to NW gradually as it approaches the southern periphery of the ridge. Models diverge on the storm's later development, but it is in consensus that GENEVIEVE should decelerate significantly as the ridge rebuilds around the storm. GENEVIEVE has weakened in the past 24 hours, and should continue to weaken due to lower sea temperatures at higher latitudes. 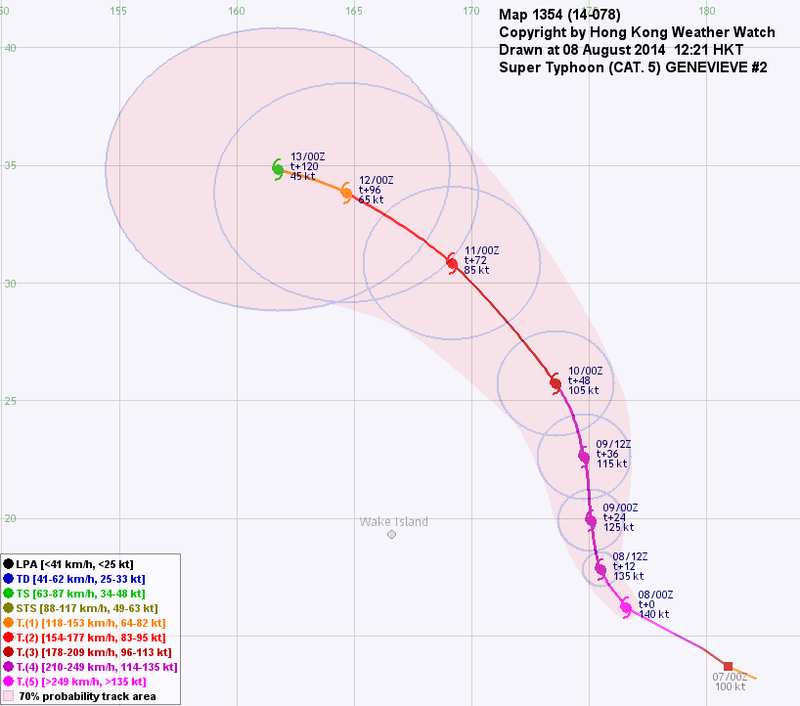 GENEVIEVE has intensified into a category 5 super typhoon. At 8 am, GENEVIEVE was centred about 1110 km (600 NM) ESE of Wake Island. The ridge is about to weaken north of GENEVIEVE, and this should allow the storm to turn north. However, the ridge is expected to maintain certain intensity, and may re-strengthen later. 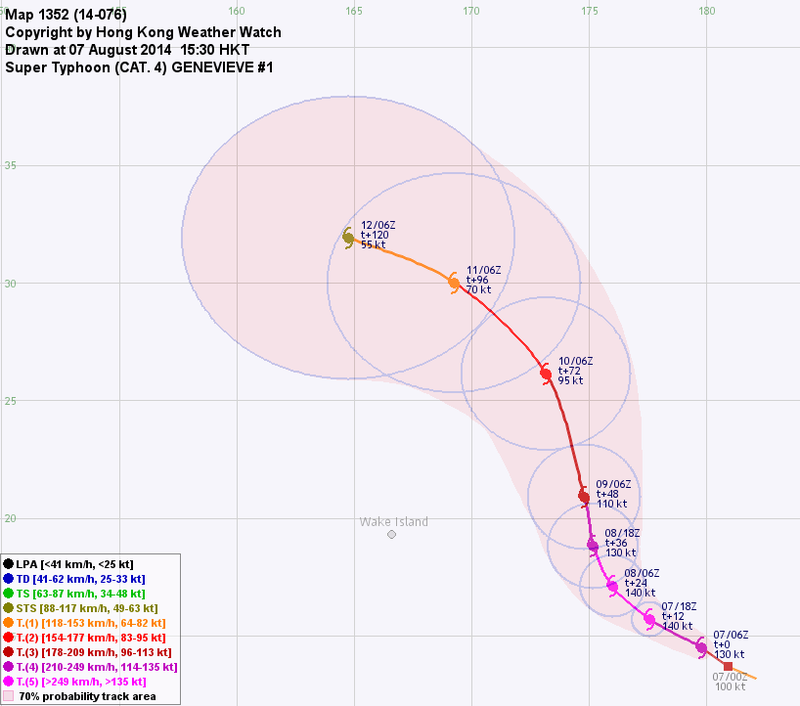 GENEVIEVE is thus forecast to turn west again at later taus. The ridge is expected to build around GENEVIEVE, and should weaken steering near t+96. GENEVIEVE possesses a thick, symmetric central dense overcast, and a clear eye can be seen embedded within it. The system should have reached its peak intensity; weakening is expected as GENEVIEVE moves north into cooler seas. Hurricane GENEVIEVE has entered northwestern Pacific Ocean, and has intensified into a super typhoon. At 2 pm, GENEVIEVE was centred about 1500 km (810 NM) ESE of Wake Island. GENEVIEVE is currently moving WNW to NW along the southern periphery of the subtropical ridge. The ridge is expected to weaken north of GENEVIEVE, allowing the system to turn poleward. However, the ridge is not expected to weaken so much to allow a recurvature, and as GENEVIEVE reaches the periphery of the ridge again its track may turn west. GENEVIEVE is intensifying quickly due to warm sea temperatures and low shear. The storm is expected to maintain significant strength over the next few days as environmental conditions should remain favourable. However, as GENEVIEVE reaches 25°N, sea temperatures start to drop and will lead to its weakening.